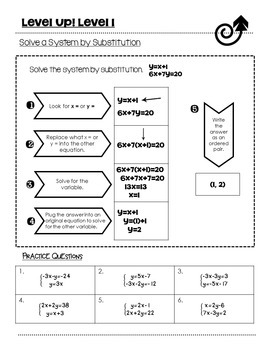 In this differentiated learning activity, students self asses their current understanding of solving systems by substitution and choose a learning level that is suitable for them and move up to the next level when they are ready. Students begin working on their level of choice and should reflect about their understanding after each problem. They should be checking their answers and if incorrect, examining the solutions. 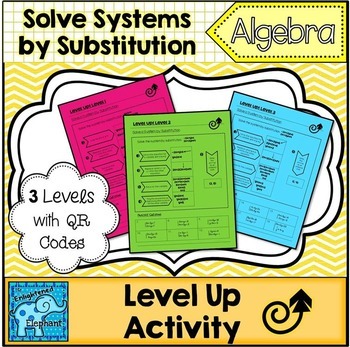 Students should trade in the level up sheets when they are ready to begin working at a higher level. 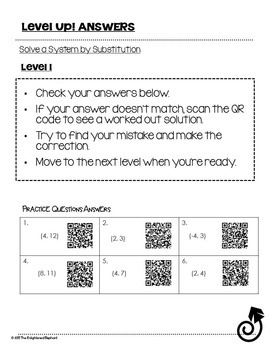 This download includes 3 different leveled practice sheets, each with a step by step example, 6 practice problems, answer sheets with and without QR codes that access the worked out solutions to each problem and a student recording sheet. Level 1: One of the equations will already be solved for a variable. There will be no fractions. Level 2: There will be a variable that is easily solved for in one of the equations to isolate a variable. There are no fractions. 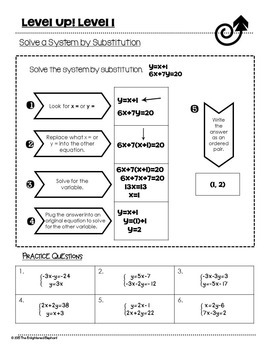 Level 3: Equations will require division by a coefficient to isolate a variable, or there will be fractions as coefficients, or fractions as solutions.